Watch as SA rally and Touring car driver, Gugu Zulu, is rendered speechless as he rides shotgun with DTM champion racer Bruno Spengler in a BMW M3. Wheels24's Sean Parker hangs on for dear life in the backseat. 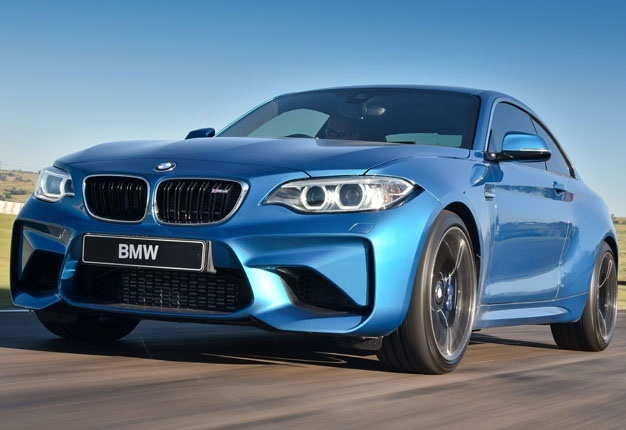 Franschhoek - When one of South Africa’s wealthiest men Johan Rupert opens up his private race track for motoring journalists to test-drive the much-anticipated BMW M2, it promises to be a good day. However, with only 63 M2s in the country, and all of them sold, BMW could only provide a solitary test unit at the launch. Driving would also only be restricted to the track (for obvious reasons). Nestled in the mountains of Franschhoek, the Motor Museum's track is a 2.5km long ribbon on tar that encourages spirited driving. The official name for it is ‘Padplaas’, a secret. It’s not imperative to clip every apex and trail braking enables drivers to get back on the power coming out of the bend to fully exploit the M2’s ferocious power. Is the new M2 special enough? With predecessors such as the classic 2002 and the 1 Series M Coupe (the first turbocharged M car), the M2 has high standards to meet: It needs to fill the gap between a sports car and a track-focused machine. The M2's mechanical set-up is straight from page 1, chapter 1 of the 'petrosexual' handbook: engine in the front, gearbox in the middle and drive in the rear. Purists will be glad to hear the rear-wheel drive M2 is available with a six-speed manual; the firm’s twin-clutch ‘M-DCT’ is a R50 000 option. The M2 borrows the M4’s ‘M-compound’ brakes, as well as the aluminium front and rear axles. Essentially, it started its life as an M235i, but has a 58mm wide front track and 48mm wider rear track to force an imposing stance. It’s a small, agile car that promises a lot, especially because BMW has shoe-horned a 3.0-litre straight six-cylinder engine (from the 235i) with M TwinPower Turbo technology, capable of 272kW. Peak torque is 465Nm, with 500Nm available if you flatten the throttle (read: overboost). BMW claims a 0–100 km/h time of 4.3 seconds (six-speed manual gearbox: 4.5s), top speed is an electronically-muzzled 250km/h, but the optional M Driver’s Package elevates that to 270km/h. The combination of the sports suspension, the 3.0-litre turbo engine, its small and agile body makes it a great sports car. With this being the entry-level ‘M’ car for the brand, the M2 should move on from the 1M. Could it handle the task? I had just five laps of the Franschhoek Motor Musuem’s race track to exploit the M2 - and boy did it impress in the short stint. I had a go in the solitary test unit fairly late in the day, but it honestly felt sensational on track. Dialled into Sport via a button on the lower console and the M2 smeared in Long Beach Blue exhibits strong front-end grip and while the engine lacks the revvy, raspy note of say the E46 M3’s 3.2-litre, the turbo unit feels responsive, dropping masses of torque everywhere. Short-shifting was suggested because the power tapers off around the 7000 r/min mark. But here’s where the M2 really shines: it’s uncomplicated to drive in a free-flowing manner and on track it rewarded lap after lap. It certainly isn’t a car that can be thrashed to get the most out of it, but with the ‘box in its sportiest setting the engine develops all that torque and corners and straights are obliterated with the ease of the Thuli Madonsela speech. Pinning the car through a series of ‘s-bends’ illustrated how delicate and precise the steering is, and thankfully the throttle is not like an on/off switch, but because of the broad torque band it has a linear feel. Ride comfort was difficult to judge, because I only drove it on a glacier-smooth track, but the firm suspension does a good job of making the baby M-car feel taught and agile. Its on-road behaviour certainly shouldn’t be an uncomfortable place to be. Shifts are quick and precise, but the most important element is that downshifts happen when you need them to, and I was never left tugging the paddle-shifts waiting for a lower gear to engage. Trail braking around the track allowed me to get back onto the power a lot earlier coming out of the corners (slow in, fast out). I floor the throttle and the speedometer quickly moves towards the 200km/h mark down the longest straight. The key is to delve deep into the corner and then turn in sharply. The M2 doesn’t break traction; enabling you to barrel towards the next corner with pedal flat to the floor. The M2 is available with a myriad of optional equipment: out of the host of options, we love the M Driver's package, which increases top speed and connected drive system. The connected driver is a great bit of technology, which links a range of apps to the car's infotainment system. There's even a GoPro app which allows the driver to record fast laps of the track with a dashboard-mounted action camera, using the iDrive Controller and Control Display. Meanwhile, the driver’s individual style at the wheel can be analysed as desired with the M Laptimer app. Information on speeds and braking points can be shared easily via e-mail or Facebook. BMW X1: Worthy of an epic SA road trip? Wheels24's Charlen Raymond takes the BMW X1 on a road trip to find out if the little SUV has what it takes to be in the same league as its bigger X-badged siblings. BMW's X-division did not start with the X5 in 1999 but rather ten years prior to the Industry-defining car's debut. Ferdi de Vos explains. I'm a 42 year old man looking to meet women between the ages of 18 and 51.